This herbal tea has only 2 calories per 8-ounce serving. Drink a cup of rooibos tea in place of an 8-ounce, 126-calorie cream soda, and you have a 124-calorie deficit. Over the long term, for example, drinking rooibos instead of soda once a week for a year can lead to almost 2 pounds of lost body weight. An animal study published in 2009 in "Phytomedicine" found that green rooibos tea helped regulate glucose metabolism, preventing increases in fasting blood glucose levels during the course of the five-week study. This effect is a result of aspalathin, a compound found in green rooibos. Poor glucose tolerance and high fasting glucose levels are signs of type-2 diabetes and are common in obesity. 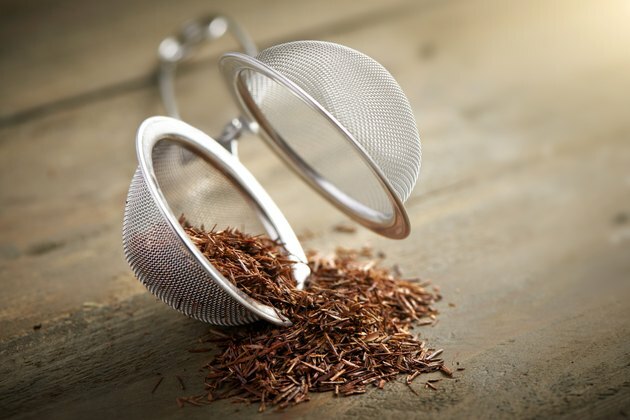 The study suggests rooibos tea may help keep blood glucose levels in check, preventing sharp spikes and falls that can trigger symptoms of hunger and possibly leading to lower calorie consumption. Phytomedicine: Hypoglycemic effect of aspalathin, a rooibos tea component from Aspalathus linearis, in type 2 diabetic model db/db mice.